Microsoft has officially announced that Windows 8 and its server version, Windows Server 2012, and the whole related ecosystem has been released to manufacturing (RTM), which indicated that the development of the OS has been completed, and the final code has already been handled to OEM partners for the purpose of preloading and preinstalling Windows 8 onto products sold to end-users. The final build for Windows 8 RTM is build 9200, and build string is said to be version 6.2 and 9200.16384.win8_rtm.120725-1247, indicating the build was signed off on July 25th, 2012. Windows Team blog published the schedule for Windows 8 release that specified who will be able to download Windows 8 at when. August 15: MSDN and TechNet subscribers will be the first to get access to the new software. August 16: Software Assurance customers and Microsoft Partner Network members will get access to the operating system. August 20: Microsoft Action Pack providers will be given Windows 8. September 1: Volume license customers not using Software Assurance will be able to purchase Windows 8 licenses. October 26: Retail copies of Windows 8 and PCs and tablets (including Microsoft’s own Surface tablet) will go on sale. The RTM of Windows 8 also signifies that Internet Explorer 10 (IE10) and Windows Store RTM is opened for business. However, a RTM build of Windows 8 is required to upload apps to the Store. Final build of Visual Studio 2012 will also be released on August 15th from MSDN. Windows Server 2012, the so called Cloud OS, will available for everyone on September 4th, 2012. Discuss the Windows 8 RTM milestone at the forum. 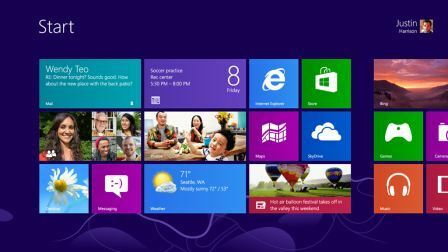 64-bit version of Windows 8 Enterprise N has leaked.